LOS ANGELES--(BUSINESS WIRE)--It's time to get this party started! 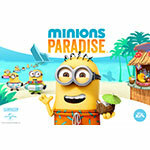 Electronic Arts (NASDAQ:EA), Illumination Entertainment, and Universal Partnerships & Licensing today announced that Minions Paradise™ is available now as a free download* in the App StoreSM and on Google Play. 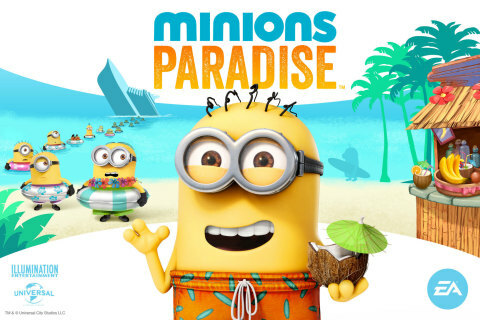 As part of an unprecedented creative collaboration between the game makers at EA and the film makers at Illumination Entertainment, the creators of the sweet yet subversive Minions and force behind the Despicable Me global film franchise, Minions Paradise introduces players to Phil, a totally new Minion created exclusively for the game. It also features a variety of lively animations that bring all the humor and mayhem of the Minions to life. Designed to grow over time with the Minions universe, Minions Paradise will provide players with new gaming experiences for years to come. Phil’s turning the island into a party-paradise and you’re invited – along with Kevin, Stuart, and Bob from the MINIONS movie! Help Phil organize the ultimate Minion party and see how it transforms your island into the perfect getaway. Customize your island with hot tubs, hammocks, and beach volleyball courts. Plant firefly trees, harness power from electric eels, and grow bushels of bananas to make an island paradise for Phil and his Minion buddies. The more land you get, the more fun your Minions will have! You can also become an expert at alligator waterskiing, throw mangoes from hot air balloons, and even dive off waterslides. All Minions need a villainous boss to serve! Aid Phil in building a special resort for all your favorite villains from the MINIONS movie. Help these despicable characters enjoy paradise while putting their own dastardly plans into motion. For news and updates on Minions Paradise visit www.minionsparadise.com. Like us on Facebook and follow us on Twitter. But one Minion named Kevin has a plan, and he—alongside teenage rebel Stuart and lovable little Bob—ventures out into the world to find a new evil boss for his brethren to follow. The trio embarks upon a thrilling journey that ultimately leads them to their next potential master, Scarlet Overkill (Academy Award® winner Sandra Bullock), the world’s first-ever female super-villain. They travel from frigid Antarctica to 1960s New York City, ending in mod London, where they must face their biggest challenge to date: saving all of Minionkind... from annihilation. EA SPORTS, The Sims, Dragon Age, Plants vs. Zombies and Battlefield are trademarks of Electronic Arts Inc. and its subsidiaries. John Madden, NFL and FIFA are the property of their respective owners and used with permission. App Store is a Service Mark of Apple Inc.
Illumination Entertainment, founded by Chris Meledandri in 2007, is one of the entertainment industry's leading producers of all-audience event films. In July 2010, Illumination, which has an exclusive financing and distribution partnership with Universal Pictures, released its first film, Despicable Me, starring Steve Carell, which earned more than $540 million worldwide and launched a beloved global franchise. With the success of 2011's Hop (over $183 million worldwide), 2012's Dr. Seuss' The Lorax and 2013's juggernaut Despicable Me 2— the highest-grossing first-run film in Universal's history and the year's third-highest-grossing film at the worldwide box office—Illumination's films have made almost $2 billion. Universal and Illumination's next film Minions, starring Academy Award®-winner Sandra Bullock and Jon Hamm, written by Brian Lynch, and directed by Pierre Coffin and Chris Renaud, arrives in theaters on July 10, 2015. Fans may also experience Minion Mayhem in 3D with the Ultra-HD movie motion simulator adventure at Universal Orlando Resort and Universal Studios Hollywood. Universal Partnerships & Licensing (UP&L) oversees NBCUniversal's consumer product licensing, film, home entertainment and television promotions, and corporate alliances for Universal's theatrical, home entertainment, television, theme parks and stage productions. This dedicated division is also responsible for monetizing the company's vast library of films and characters through licensing, branding and marketing opportunities. UP&L is part of NBCUniversal. NBCUniversal is one of the world's leading media and entertainment companies in the development, production, and marketing of entertainment, news, and information to a global audience. NBCUniversal owns and operates a valuable portfolio of news and entertainment television networks, a premier motion picture company, significant television production operations, a leading television stations group, world renowned theme parks, and a suite of leading Internet‐based businesses. NBCUniversal is a subsidiary of Comcast Corporation. Minions Paradise is a trademark and copyright of Universal City Studios LLC. Licensed by Universal Studios Licensing LLC. All Rights Reserved.